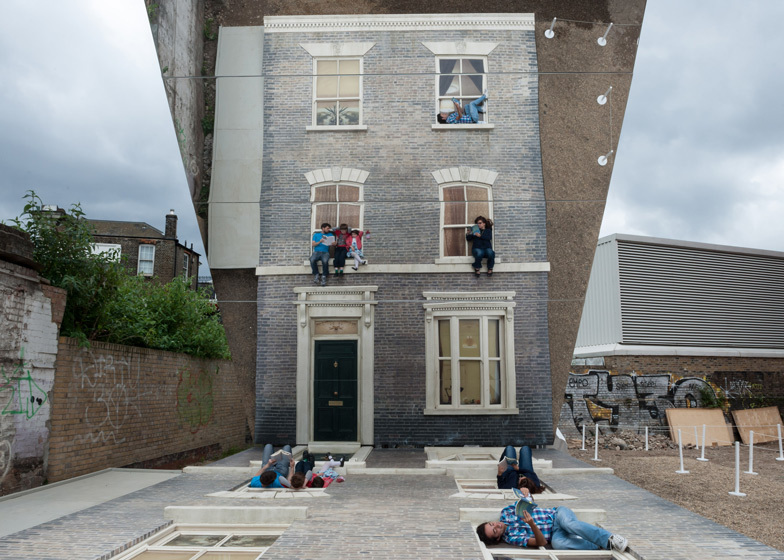 It might look like these people are scaling the walls of a London townhouse but they're actually lying on the ground, reflected in a huge mirror as part of an installation by Argentinian artist Leandro Erlich (+ slideshow). 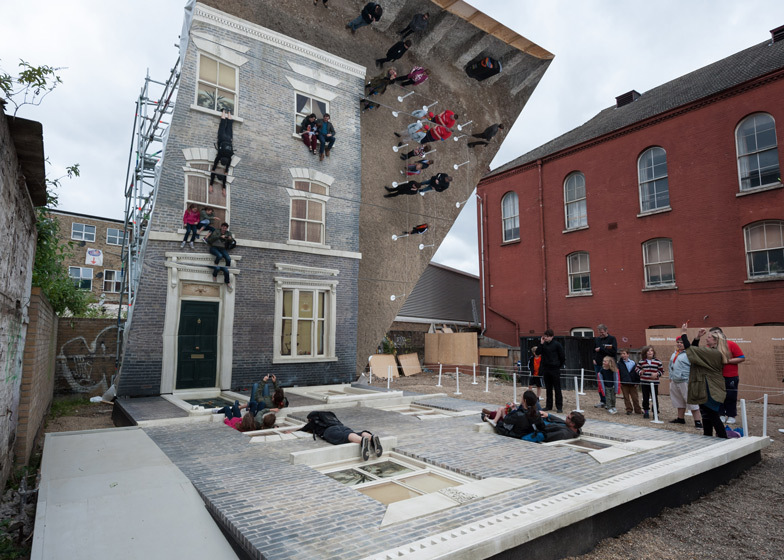 Located in Hackney, Dalston House by Leandro Erlich is a temporary installation comprising a reconstructed house facade lying face-up and a mirror positioned over it at a 45-degree angle. As a person walks over the surface of the house, the mirror reflects their image and creates the illusion that they are walking up the walls. Similarly, visitors can make it look like they are balancing over the cornices or dangling from the windows. The brick walls and decorative window mouldings of the three-storey facade are designed to mimic the nineteenth-century Victorian terraces that line many of London's streets, particularly a row of houses that once occupied this site on Ashwin Street. Commissioned by the Barbican gallery, the installation opened to the public yesterday as part of the London Festival of Architecture 2013 and will remain on show until 4 August. Leandro Erlich is well-known for using visual illusions in his artworks. Past projects include a seemingly floating remnant of a house created in Nantes and a fake pool of water in Toulouse. He also created a similar house reconstruction in Paris in 2004. Last year Dezeen ran a special feature celebrating world-class architecture and design created in the London Borough of Hackney and also hosted a event of talks and discussions, shown in a series of movies we published. See more installations on Dezeen, including an arched foam screen with hundreds of building-shaped holes and a topographical landscape of stone and water. Photography is by Gar Powell-Evans. 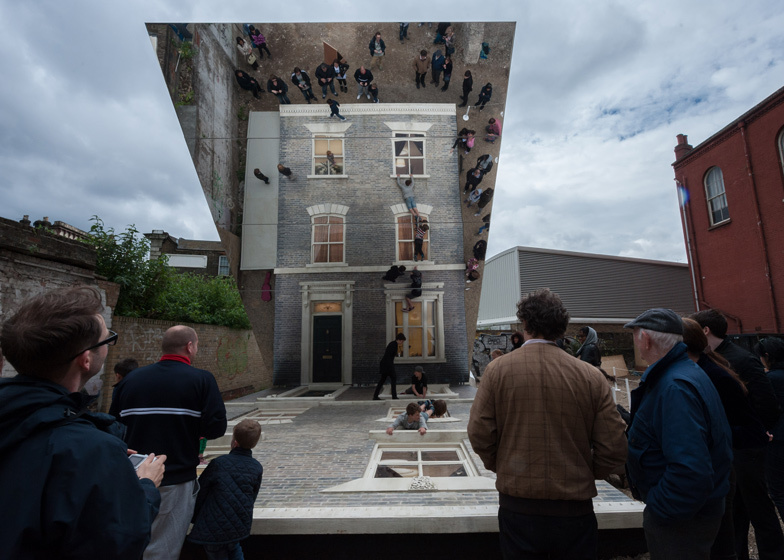 Internationally known for captivating, three-dimensional visual illusions, Argentine artist Leandro Erlich has been commissioned by the Barbican to create Dalston House, an installation in Hackney. The work resembles a movie set, featuring the façade of a late nineteenth-century Victorian terraced house. The life-size façade lies on the ground with a mirrored surface positioned overhead at a 45-degree angle. By sitting, standing or lying on the horizontal surface, visitors appear to be scaling or hanging off the side of the building. Sited at 1–7 Ashwin Street, near Dalston Junction, Erlich has designed and decorated the façade – complete with a door, windows, mouldings and other architectural details – to evoke the houses that previously stood on the block. 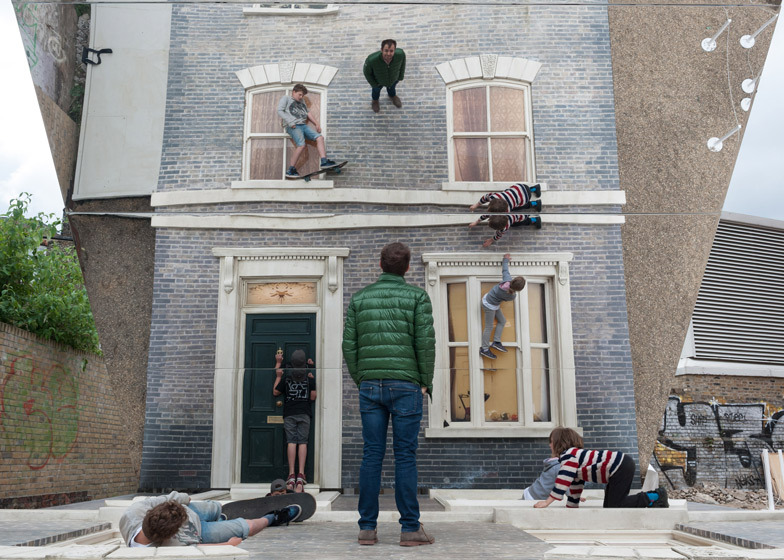 Leandro Erlich: Dalston House opens on 26 June 2013 and is presented on Ashwin Street in association with OTO Projects. It is also part of the 2013 London Festival of Architecture. 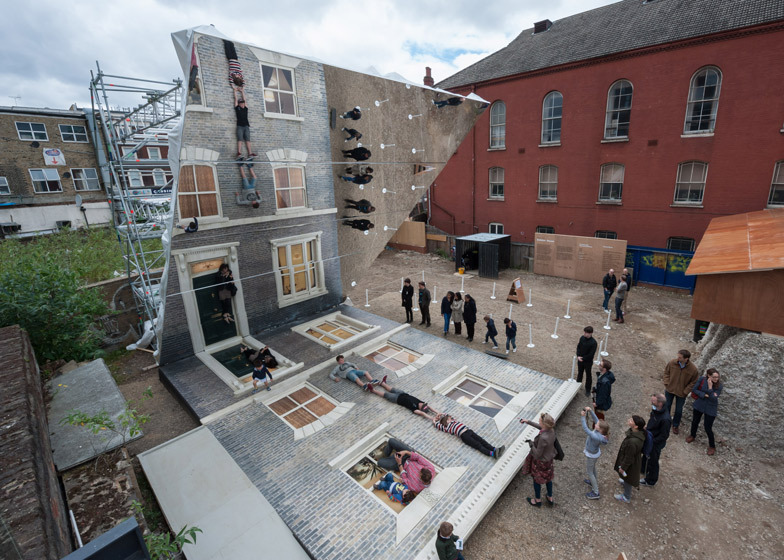 Leandro Erlich: Dalston House is installed on a disused lot that has largely remained vacant since it was bombed during the Second World War. The installation extends the Barbican's programme of Curve commissions to east London and is part of Beyond Barbican, a summer of events outside the walls of the Centre that includes pop-up performances, commissions and collaborations across east London. Beyond Barbican builds on the Barbican’s long history of programming work in east London that connects communities in the boroughs surrounding the Centre with some of the best art from around the world. The commission follows the success and legacy of Dalston Mill by EXYZT, a temporary installation and participatory project staged by the Barbican in Hackney in 2009, which reopened in 2010 as the Eastern Curve Garden. Dalston House is presented on Ashwin Street in association with OTO Projects. The Barbican is an official partner of the London Festival of Architecture 2013. Supported using public funding by Arts Council England. Additional support from the Embassy of the Argentine Republic.